Marc Brightman teaches language arts at CCDS. He holds a Bachelor of Arts degree from the University of Mount Union in 1993 in Sports Management with minors in English, secondary education, and physical education. He earned his Masters degree in education in curriculum and instruction with an emphasis in classroom instruction from Ashland University in 2003. 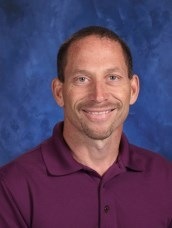 He has taught language arts at the middle school and high school levels for 24 years. He adores teaching literature, writing, and grammar to his middle school students with a focused passion on the mythic structure of the universal hero’s journey. He has also coached track and field for 21 years and helped to establish a successful cross country program for 17 years including three conference championships and three appearances at the state meet. Mr. Brightman is an avid baseball card collector and enjoys spending his time reading, exercising, and spending time with his family and three dogs. He has been married for 20 years, and he has two daughters. Star Wars, Harry Potter, and Lord of the Rings have been major influences in his life. He ran the Boston Marathon in 2009 and 2010 where he finished in the top 25%. He can be seen running on the trails of Stark Parks with his goldendoodle Rilee. He is excited and looks forward to beginning this new chapter of his life with his students, their families, and his new colleagues at CCDS.